During a movie career that spanned 48 years beginning in 1915, Tom London had a face everyone recognized from his nearly 550 movies and close to 100 TV episodes. 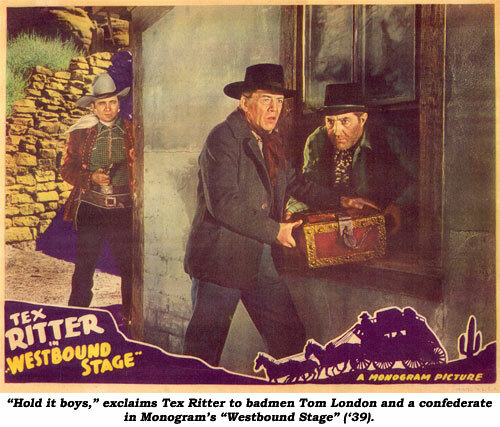 Then there’s dispute of Tom being in the “first” western, “The Great Train Robbery” in 1903. Some filmographies list it, some don’t. Some western film historians say he was, some dispute it. 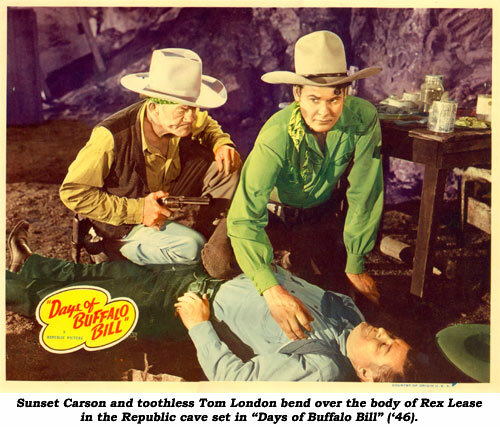 However, freelance writer Jack Lewis (who wrote screenplays for “King of the Bullwhip”, “Outlaw Gold”, “Cisco Kid” episodes and others, as well as owning and publishing such magazines as GUN WORLD) interviewed Tom in 1954 during the filming of “Gunfighters of the Northwest” serial. Tom indicated to Jack he was in the picture, but offered a sly chuckle about his birth year as he did so. If he was in “The Great Train Robbery”, he was only 14 at the time. Certain facts indicate otherwise. 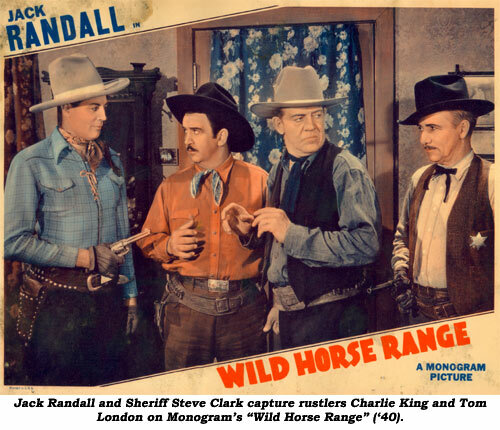 Throughout the silent era of the teens and ‘20s London rustled cattle, shot sheriffs in the back, ran sheepmen off their land and every other rotten deed as he functioned as a badman opposite Fred Church, Tom Mix, Eddie Polo, Hoot Gibson, Leo Maloney, Jack Perrin, Ken Maynard, Pete Morrison, Lefty Flynn, Fred Humes, William Desmond and others. As Leonard Clapham, he even achieved star status in a host of two-reelers co-starring Virginian Browne-Faire at Universal in 1920. When sound came in, Tom’s hearty, slightly nasal, but deep baritone voice made the transition easily. Developing a reputation as a true professional, he was cast constantly in westerns and serial after serial. Speaking of serials, we count Tom being in at least 60. 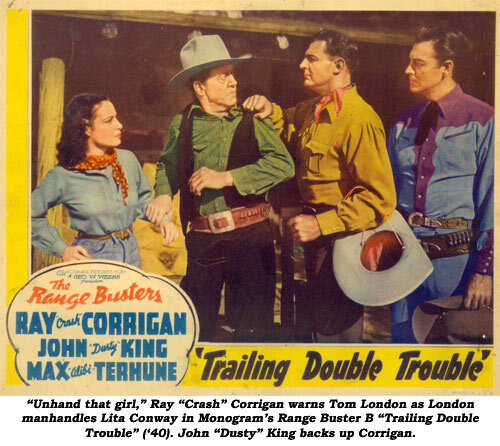 Republic was utilizing London so much in their westerns that they signed him (and fellow freelancers Roy Barcroft, Bud Geary, Kenne Duncan, Jack Kirk and LeRoy Mason) to term contracts in July 1943. 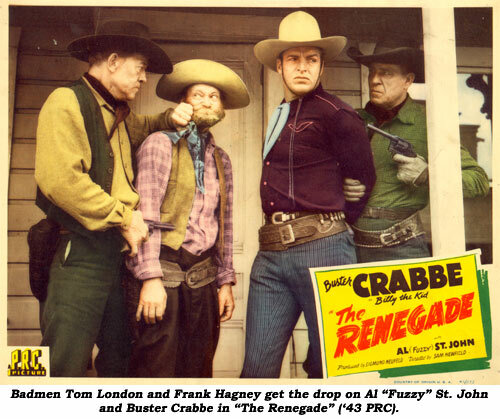 Tom stayed under contract til July ‘47 playing sheriffs, sidekicks (especially to Sunset Carson), ranchers, fathers—and badmen. 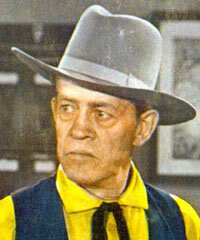 As he turned more to character roles when his Republic contract ended, three of his best are as tough old Marshal Blackjack Flint in Jimmy Wakely’s “Brand of Fear” (‘49 Monogram), as Jocko Mahoney’s weathered sidekick Doc Laramie in “Cody of the Pony Express” (‘50 Columbia serial) and as “ghost rider” old man Roberts in “Riders In the Sky” (‘49 Columbia) starring Gene Autry. When TV came along, it was just another medium in which Tom could work. Now 61 in 1950, he left the owlhoot roles to a younger group of bushwhackers and concentrated on playing grizzled old-timers, sheriffs, scouts and the like. Gene Autry respected his talent and used Tom on close to 20 of his Flying A TV productions. 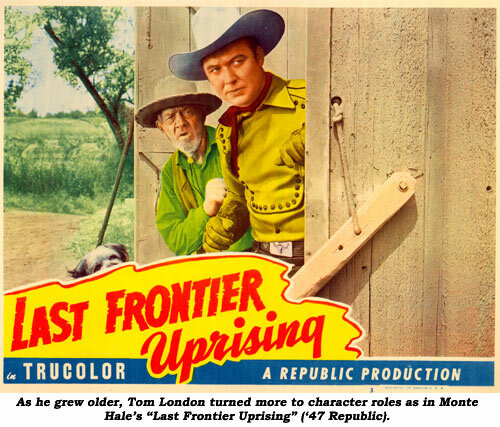 Tom also worked on “Roy Rogers”, “Kit Carson”, “Lone Ranger”, “Laramie”, “Cisco Kid”, “Death Valley Days”, “Fury”, “Wyatt Earp”, “Have Gun Will Travel”, “Bat Masterson”, “Tall Man” and others. Although the ideal western character actor on screen, off-screen Tom was a different person. He had an uncle who owned a clothing store, enabling him to buy all his clothes wholesale. Seen around town, he was a well-dressed man, especially when he went out dancing in the ballrooms, which he loved to do. Tom lived in later years with his sister Anita J. Pearcy. However, contrary to published accounts, he was married at one time to silent screen actress Edith Stayart who preceded him in death. This is proven by the word “widowed” on Tom’s California death certificate. London wound up his career in 1961 with a bit role in “Underworld U.S.A.” and an episode of TV’s “Miami Undercover”. According to his death certificate, he served with the armed forces during WWI, probably circa 1917-1918 when his film credits are quite sparse. The beloved Tom London, 74, passed away at his home at 4368 Camellia Ave. in North Hollywood on December 5, 1963.